A lot of people have witnessed a person shocked back to life after suffering from a cardiac arrest. It’s not the same scenario as many of you have seen it on television, though he picture painted is more or less similar. The only difference is that your response won’t be of excitement rather it will be filled with Adeline as the cold hard reality of someone actually dying in your presence hits you. The procedure of shocking someone to resuscitate them can actually be done in an out of hospital setting. These places can include your home, the gym or even on the city streets depending on where a cardiac arrest event or situation occurs. It’s important to note that AEDs will only help a person if they have a particular heart rhythm that their electrical pulses can respond to. It’s in such cases that chest compressions or CPR will be best suited to save the life of that person. One can acquire an AED without necessarily having a prescription from a doctor. The only question one should ask is whether or not the equipment will be useful to them when they need it the most. One suffers from a cardiac arrest when their hearts electrical activity malfunctions. This leads to the heart pace experiencing what can either be ventricular fibrillation (Chaotic) or ventricular tachycardia (dangerously fast). The heart will then stop due to arrhythmia (irregular heart rhythms) and this can lead to death since oxygenated blood isn’t being pumped to other parts of the body. As mentioned earlier, CPR mostly helps in making the blood flow to other organs. It can’t in most cases revive the heart. That’s why one needs to use the AEDs as they are one of the few devices that can restore the normal hearts rhythm. The AEDs can come in handy when one experiences what is known as ventricular fibrillations. This is when your heart starts beating irregularly. The shock waves sent to the heart help it restart and function in a normal manner that won’t put you in harm’s way. 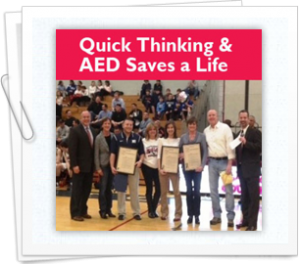 AEDs are nowadays being placed in public areas such as schools, restaurants, stadiums and bus and train stations. This makes it easier for bystanders to access them and help a person who might be suffering from sudden cardiac arrest. They are also carried by the police who can come in and help before the paramedics arrive to the scene.